As you may have noticed from the special birthday icon on the top navbar of our site, HubPages is celebrating its fifth birthday. It is strange to think that only five years ago, HubPages was only just getting started- especially when one considers how much the community has grown over the years. Because five is a big milestone, we decided to do something beyond celebrate with some cake- we launched the first ever Hubbie Awards. As you may have noticed, we invited everyone in the HubPages community to vote for their favorite Hubs and Hubbers. This Wednesday, we tallied all of the votes, and today, we’re happy to announce the winners! Congratulations to all the Hubbie Award winners! I am so honored to win the “Most Helpful Hubber” Award! I wasn’t even aware of this contest. I want to thank all the people who voted! I really appreciate it! I would also like to the the HubPages Staff for all their help over the last 2 years, especially Simone Smith, Robin Edmondson, and Jayson Menayen. Thanks everyone! Why didn’t you dare do the happy birthday bit Simone? And why are you all so white despite it being August in California? August+California+Work=Not enough time to enjoy the sunshine? It’s good to see that two of the votes that I cast were winners, I feel like I have done my good deed for the day. Wow! Thank you so much! I am also so honored and blown away! I’ve been dealing with a family emergency and have been out of town. I didn’t know about this contest but it makes my whole week – for REAL! My hat’s off to all the winners and all the great writers at hub who have helped me so much!! OMG …Congratulations to all…especially SUNSHINE!!! Woo hoo!! Congratulations to all the winners!!! I’m honored to have won Most Likely To Go Viral!!! That’s quite a compliment. I’m truly proud to be part of the hubpages community. A special shout-out to cogerson, mentalistacer, sunnie day and cardelean!!! Kudos!!! Congrats to the winners indeed!! And Ryan, alas, tanning booths are not promised to the HubPages staff until the 10 year birthday. Congratulations to one and all!!! How awesome!!! AND Happy Birthday, HubPages!!! Thanks of course to all the Hubbers who voted for me. But I had to post for the great way you (Paul) did the letter thing – it was really nice. And I’m glad you all love Winnie the Pooh! Congrats to winners. I love the video and meeting all the staff and administrators. I feel like I was in the front row of the Hubbie Awards. Wow, I am both shocked and honored at winning not one, but two Hubbie Awards. Thanks to all that voted and congrats to all of the winners! At first: Congratulations all winners! Second: Happy birthday HubPages team! Third: What a wonderful video! They were most funny, joyful and enjoyable 17 minutes today for me, indeed! Fifth: I promis to check all your brilliant publications step-by-step. Congratulations to Paul and all the team at Hubpages for such a fantastic canvas to work on and to all the winners !! Congratulations everyone. I am honoured to have received a Best Poet award and share my award with some wonderful poets and writers. Thanks everyone for your support. Long Live HubPages and all its hubbers, we’re the best. Happy Birthday to HubPages! – and I think there will be many more. The site continues to improve on a monthly basis and is realy “alive.” I had no idea I’d received an award until Happyboomernurse alerted me. So thanks to her for opening my eyes. Lots of good things are happening at HubPages! Thanks again. Thank you for the honor, and conratulations to all the winners! Congratulations to all of the winners and Happy Birthday, HubPages! I came here to congratulate Cagsil for being voted “Most Likely to be Banned” but I understand he’s banned again! LOL! Congratulations to Epi on winning spots in TWO categories of the best of the best … of course all of his followers already new this was the case. Way to go Epi my man! Congratulations to Will Star on this well deserved honor! If you haven;t read his hubs, you are missing a great deal! Am still reading the winning hubs. I have to say the judges are superb. Great idea to have the birthday!! Happy Birthday! Hi Guys, just wondered if the Hubbie Awards will be an accolade, as it was voted by the HubPages community? Appreciate the award and would like it to be remembered. Quite a feather in the cap really. Excellent question, Tony DeLorger. There WILL be an Accolade for this! We are just working on some back end details to get that set up. Congrats! Congratulations to the winners, many of whom I voted for, and all of whom are deserving of this honorable recognition. I want to thank HP staff for the fun video announcement which was extremely well done. I also want to acknowledge many other hubbers who produce excellent hubs. I follow them faithfully because reading their hubs enriches my life, and I try to make a point of letting them know how much I appreciate and enjoy their hard work through the comments I leave. They’re all winners in my eyes. Well…I guess I was oblivious to this contest too before today! But I did watch the entire video. I must say it was sweet and well-done. “Most religious”….? Whether that label carries negative or positive connotations wherever, I’m honored by it and thanks to all who voted for me! Congrats to Will Starr and all the others; there are some really good writers around here! I’m simply glad to be able to talk about the most awesome author of all—the Holy Spirit. My gratitude to the HubPages Team for providing the opportunity/platform to do so. And Kimberly, although I already knew was the greatest, is now, the greatest!!!!!! Tomorrow the world……hmmm…she should be working showing Kid Rock how to be cool!!!!! Happy Happy birthday, from all of us to you. We wish it was our birthday, so we could party too, HEY! 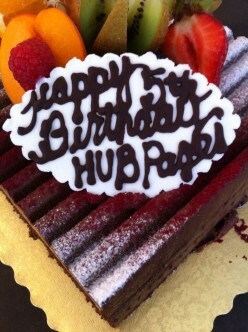 Congrats, Hub Pages on 5 years! I am a stranger to this site, but i have to say what a shameful crime this is. In my small village the elders tell stories of the handsome man whose great writings brought my people strength and wisdom during times war, hunger and bordem. That man”s name is Greek One. Here you all are, smug in your concrete block office and your west coast attitudes handing out awards like you are feeding scooby snacks to Snooki, and Greek One just one gets just one small that he has to split with two other guys?!!! This man is the Mark Twain of our times and you insult him this way? Clearly the only way to make amends would be to deposit $100 into his paypal account as soon as possible. Hopefully that small symbolic move would suffice to make amends for this terrible situation. We most sincerely apologize for the lack of fanfare that this most esteemed Hubber has received. Oh, how our hands were tied in this manner! Community voting can be a very troublesome thing, especially when HubPages staff members (or at least those with more autocratic souls) know how much better it would be if we handpicked each and every winner. Thank goodness the official HubPages shirt we are sending to this honored Hubber shall quickly appreciate in value to well over $1000. Perhaps the resale value can be of some comfort to the mythical storyteller- though obviously there is no overcoming our egregious gaffe. Do rest assured, Someone, that we are all hanging out heads in shame. A big congratulations to everyone! Well deserved!!! Congrats to ALL the winners….cheers!